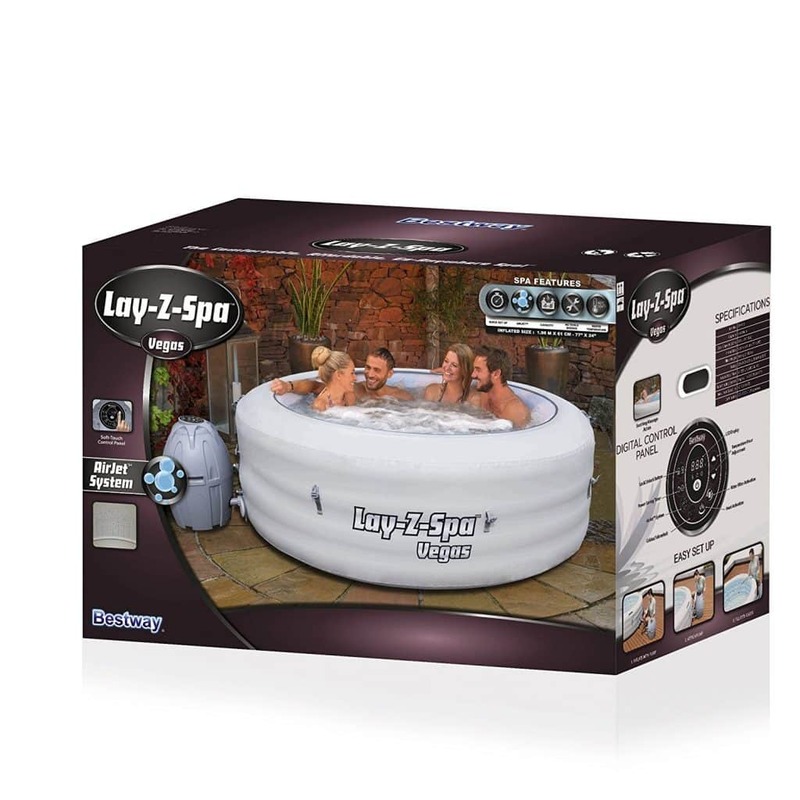 Lay Z Spa is the market leader of inflatable hot tub products, known for producing high-quality hot tubs at a fraction of the cost of a fixed hot tub. Their inflatable hot tubs offer a relaxing experience while being versatile. They aren’t a permanent fixture so can be moved around and used as needed, are quick and easy to install, and still offer the soothing you expect from a hot tub. The Vegas is one of the best-selling Lay Z Spa products. Released in 2012, it remains very popular thanks to an affordable price and range of great features, making it a worthwhile investment for anyone considering an inflatable spa for their home. Let’s take a closer look at the Lay Z Spa Vegas to see what it has to offer! The Lay Z Spa Vegas is an inflatable hot tub with an 848L capacity. This isn’t the largest water capacity for an inflatable hot tub, but still enough to sit four people comfortably, while six people could fit in, although it’s more a tight squeeze. As an inflatable hot tub, it offers quick and easy installation, with around 10-minutes to set-up. A digital control panel offers simple operation, including heating the tub to its maximum temperature of 40°C and using the 87-air jet system. Both can be controlled simultaneously, which is a nice feature and one not found on every inflatable hot tub. A robust water filtration system makes maintaining the Vegas straight-forward and hassle free, as does the leatheroid cover with inflatable lid. All in all, the Lay Z Spa Vegas offers fantastic value for money. It provides a great hot tub experience for a very reasonable price, while being simple and convenient to use. One of the first things you notice with the Vegas is how easy it is to install. Inflatable hot tubs are often a hassle to inflate and fill, but setting up the Vegas is quick and easy, taking around 10 minutes. Everything needed to install the hot tub is clearly labelled, while a DVD explains the entire installation process. The plug-in pump does all the inflating for you in about 10 minutes, although filling with the 848L of water is going to take a lot longer, usually several hours. The Lay Z Spa Vegas does require a lengthy time to heat, although this is common for any inflatable hot tub. Even then, the rapid heating system is one of the better types on the market, taking around 10-hours to hit the maximum temperature of 40°C. One of the best features the Vegas offers is the fact the heating and air jets are a dual operated system. This means the air jets can be used as the water heats, letting you enjoy the water as it hits that perfect temperature. The 87 air jets offer a wonderfully relaxing massage when inside the Vegas. These air jets surround the tub, hitting you with soothing bubbles from every direction, offering the perfect hot tub experience. The digital controls on the Vegas are typical of most inflatable hot tubs but useful none the less. This allows for control over the temperature setting, but more importantly a timer controller heater unit. With this, you can pre-set the timer to have the heating system automatically turn for up to 72 hours before use. This feature is so useful given the length of time it takes the water to reach the maximum temperature. For instance, you could set the timer to go off when you’re sleeping so it is ready for the morning or when you are away at work so it’s nice and warm for you coming home. Inflatable hot tubs are a great addition to any home but maintaining them is often challenging. The Lay Z Spa Vegas doesn’t have such an issue thanks to its water filtration system. This includes two filter cartridges and a filter housing unit, which provide the necessary chemical treatments to keep the hot tub clean and hygienic. It is worth noting that filters do eventually need changed. How often depends on the amount of use, although it’s generally a couple of weeks give or take. Chemicals should be added daily but the process takes five minutes at the most, so it’s quick and simple in most instances. There is also an inflatable lid to keep the water and inside of the tub clean when not in use, while a leatheroid cover is also included to keep the exterior clean. The lid is also insulated, so can be used to help maintain the heat. While the maximum capacity of the inflatable hot tub is stated as six, we recommend only using it to sit four or maybe five people. This is because at maximum capacity it is a bit of a tight squeeze and not the most relaxing, which ruins the purpose of the Vegas. However, even with six people inside the tub it remains very stable, thanks to the quad horizontal ring construction that offers a robust frame for sitting against. Don’t worry about it collapsing in on itself or anything like this. If you want to enjoy the comfort and pleasure of a fixed hot tub but for a fraction of the cost, then the Lay Z Spa Vegas is worth checking out. For this price you will struggle to find a better performing inflatable hot tub, which has some great features including a nice maximum temperature, powerful air jets, and the ability to use both simultaneously. While filling water to maximum capacity and then waiting for it to heat is going to take some time, this is a standard process for inflatable hot tubs. Plus, the fact you can set the heater to turn on automatically removes much of the hassle. Sitting four or five people allows you to get the most out of the hut tub, although six people does make for a bit of an uncomfortable fit, but other than that there isn’t much to complain about with this product! We have also reviewed the Lay-Z Spa Miami here, the Lay Z Spa Palm Spring and written a inflatable hot buying guide for you to check out.